It’s been a very active week here in Cheongpyeong so far. In everything we do, we’re growing closer together as one global family. We started off our last week with a GTGY-wide sports day: the Korean, Japanese, and international groups all came together to spend time with each other and have fun outside! We started out doing the Bounce dance around the Tree of Love in the main courtyard. Some people turned the dance into a competition and wanted to see who could last the longest and set a “Guinness World Record” for dancing to Bounce. A couple of the Cheongpyeong Angels even came out to dance with us and offer moral support to the competitors. The rest of us went on to play many different sports like basketball, volleyball, and soccer, as well as pull-up competitions, jump rope, and relays. As the day drew on and the temperature got hotter, a lot of us just jumped into the spray of the Cheongpyeong floor fountains or the bouncy-castle pool that the staff had rented just for the day. There was a lot of music and laughter–and also a lot of water guns to keep things exciting! A couple of days later, we participated in a Peace Road event by the DMZ. Just like the participants at the Global Top Gun workshop in February, we had a chance to ride bikes representing God and True Parents’ dream for a peaceful world and demonstrating our desire to see North and South Korea peacefully united. During the opening ceremony of the Peace Road event, some of us had the opportunity to perform the “Waka Waka Dance” in the spirit of creating a united world. After hearing several inspiring speeches about the importance of North-South reunification, about 60 of us released doves of peace into the air as a symbol of hope. Finally, about 200 of us took to the road! Many of us felt that this was a really special opportunity to be together and serve God and True Parents, representing nations from all around the world. At the end of a week of Divine Principle study, our middle and high school participants of the GTGYers gathered in the main lecture hall to greet Prof. Yeon Ah Moon on Saturday, August 13, 2016. The university students waited eagerly just outside the hall for their opportunity to interact with Yeon Ah Moon, too. Yeon Ah Moon has a way of being very authentic and sincere in her sharing and is very honest about the reality of our movement today. It’s refreshing for the youth to hear her speak, and they are able to feel understood and cared for by a member of True Parents’ family. At the beginning of our meetings together with her that day, Yeon Ah Moon asked what we would like to hear her speak about first. She set up a very relaxed and casual atmosphere, inviting us to get comfy, to stand if we wanted, and to keep in mind the donuts she had brought to share with us afterward. Someone in the hall yelled out, asking her to please start by sharing some of the memories she has with True Parents. Yeon Ah Moon read a passage from True Father’s words and began sharing from there. Yeon Ah Moon reminded us that she, too, grew up as a second-generation Unificationist and offered us advice about developing a relationship with True Parents as people born into this movement. She continued, “If you begin with the little things and develop this good habit of starting your day with True Parents, at first you have to try to do it and then it becomes something you just do—something automatic. Start your day like this everyday, with God and True Parents. One of the participants commented that among the second generation of our movement, it can be hard to see positive things and that many of our peers are becoming distant. She asked how to best let those who are growing distant know about the heart of True Parents and the vision of our movement. She wanted to keep sharing with the seonghwa students and extended her time with them, but not long after that, the university students piled in to the lecture hall at 8:30 p.m., even though the seonghwa students had not yet left and Yeon Ah Moon had not yet finished speaking with them. Yeon Ah Moon had so much to share. Her heart is really that of an older sister who wants her siblings to connect to God and True Parents more deeply. 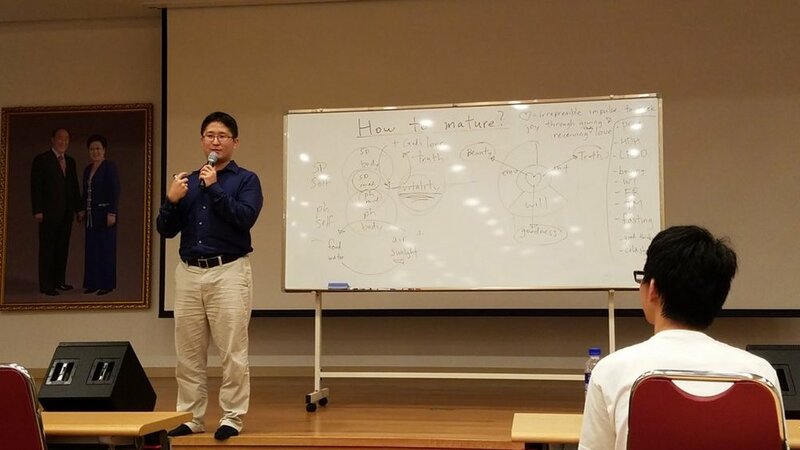 Once the university students had entered the room, Yeon Ah Moon began discussing the Blessing, the stages of the heart, and development of love. “Please try to completely experience each stage of love so that when you become parents you can really love. “I looked at love from a very secular perspective before. What about you? What do you think love is at first? Movies make love at first site look amazing; but reality is not like that. Can you imagine what it would have been like if Romeo and Juliet had not died? “You need to have a vertical and a horizontal standard. You have to have give and take horizontally or it will all fall to the wayside. Yeon Ah Moon concluded, “True Parents existed in the blueprint of creation. The word True Parents existed before creation. They began as the standard of creation. Then what is the wish of Heavenly Parent? It is True Parents: God-centered parents who can give and receive love unconditionally. At 11:00 p.m. and Yeon Ah Moon was still talking! The Japanese GTGYers heard she was here and joined us. There’s an excellent spirit, and everyone is still fully alert. Before leaving, Yeon Ah Moon took photos with groups of 80 people at a time, always making it a point to say hello to everyone and to acknowledge each person. Her openness and love are incredible. Though it was so late, the night ended on a very high-energy note with participants running around the lecture hall in large circles, chanting the GTGY motto. “The best part of Yeon Ah-nim-unni’s speech was when she said we should always have True Parents’ heart. Because True Parents have done so much for us as second generation—and True Mother now, at this age, is so tired—I think we really have to let her rest and go to the front line to help True Mother in the work of the providence. I feel it is our obligation as second generation to fulfill our responsibility and to give True Mother joy and to work hard. She’s aging, so it’s time for us to do our best and to give much effort to support True Mother in carrying out the work of the providence. Be sure to follow what happens next as we enter our final week of the workshop! A typical day this past week opened with morning lectures, and then participants spent the afternoon engaged in various activities, appropriate for each age group and stage of life. Middle school participants took part in activities designed to promote bonding between them, and to instill a sense of self-value and self-love within each participant. The middle school youth emerged feeling more confident and more connected. For university-aged participants, activities included several ice-breakers, introspective assignments, and team-building exercises. 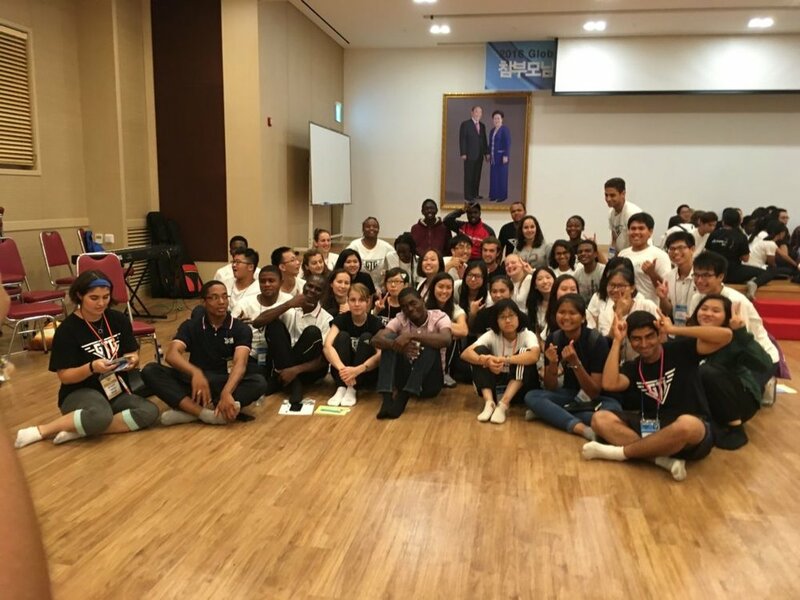 Though many of the participants do not speak English, translators, singing and fun activities helped everyone to bond and create international friendships. In one activity, participants wrote down a list of walls that they tend to put up, which block their original selves and contribute to their personal vulnerabilities. They then wore a sign with their number one personal wall, and walked around the room talking to each other about it. Justin Okamoto of CARP USA also led a vision statement exercise, encouraging everyone to envision the future that they want to see, and the future that True Mother wants to see in this world. “It was a very powerful session,” said Jinil Fleishman from Las Vegas, USA. In the evenings, participants had exciting clan-wide open mics and testimony sharing. August 7 was our first day of lectures at the Global Top Gun Youth workshop. After a long pilgrimage journey throughout Korea, participants are ready to engage in thought-provoking discussions and internal growth activities. The interactive reflection periods here are anything but quiet introspection; they are high in energy and loud with love, giving youth a sense of identity as young Unificationists and allowing them a chance to connect in heart with more of their brothers and sisters around the world. They’re getting a daily dose of self value, confidence, fun and laughter. “I just love my brothers and sisters so much!” Said Kengo, a GPA participant at GTGY. The love generated here across borders with other young Unificationists around the world is priceless. To open the Divine Principle lecture series, Naokimi Ushiroda, President of the Collegiate Association for the Research of Principles (CARP) USA, gave a presentation on the Original Mind to middle and high school participants. Justin Okamoto of CARP USA also spoke to participants, including the university students, who also began introductory lectures this week. Middle high school participants are encouraged every evening through intentional games and activities to realize themselves as children of God, being pushed ever inward to connect with their original selves. August 10 was Justin Okamoto’s last day lecturing with the university students. He was met with enthusiasm and encouragement. His lecture series was received by attentive ears and hearts eager to take away habits and practices to propel participants forward in their dreams. The day was spent leading participants toward creating their own vision statements to move their lives towards creating and fulfilling their dreams. The lecture series ended with everyone singing and praying in unison. In the evening, participants shared short testimonies within their clans and then later as a tribe. My favorite experience so far has been listening to lectures from Naokimi and Justin. I thought commitment is what brings my mind and body to unite. Naokimi said, “If you love someone, you will do anything.” I immediately realized how right he was. Love is what unites our minds and bodies. I saw this truth in coming to this GTGY workshop. When I heard that True Mother was holding this workshop, I knew right away that I had to be here. I felt my heart pulling me here to help True Mother to accomplish her goal. So my mind directed my body and here I am. I’ve gained so much spiritually in these past couple of days that I have in this year. The lectures have given me a sense of clarity within myself and who I am as a person. In the past I had not been interested in reading the Divine Principle from cover to cover. However, the lectures in this workshop made me want to study the Divine Principle more and read it in its entirety. Within the last two days of the GTG Youth workshop, I felt that I was really enlightened through the Divine Principle lectures. I was inspired and learned so many new things that I didn’t know about before. During this workshop I’ve realized that I really didn’t understand the Divine Principle in such a practical way. I couldn’t imagine that the Divine Principle in itself, excluding True Parents’ words, could touch my heart so deeply. So many questions I prayed to receive the answer are now appearing in front of me just by looking things in a different way. It’s so amazing to think that the Divine Principle applies to all our situations and life. Naokimi said one thing that really hit me like a realization. It was one of those things that are so obvious and logical but we don’t see it until someone tells us. That the secret to mind-body unity is LOVE! I always would think that mind and body unity is such a hard thing, and that you need to make so many conditions to achieve it. However if you love, then you no longer need to force yourself to do it. That really resonated with me and I almost cried. With regards to lectures, I just find them some of the best lectures I’ve ever had and that’s truly sincere. I’ve heard Divine Principle lectures a lot, but I feel I learned how practical and logical the Principle can be. And maybe also a way that I can explain the Principle to others. I am amazed by the way the Divine Principle has been broken down and brought to everyday experiences. The methodology of teaching is very convenient as we come to understand how Divine Principle can help us and thus we can find easy experiences to share with the people that don’t know Divine Principle. I understand that I cannot convince anybody to understand or to study Divine Principle if I myself cannot understand it or see real examples of how it has helped me. I really appreciated the lectures, especially the ones in the morning. It will really help me when I will be witnessing to someone, as it really teaches us how to outreach. We continued into a second day of pilgrimage on August 4, stopping at Holy Ground sites in Busan and Mungyeong, respectively. The group that visited Busan had the opportunity to visit the Beomnaegol Memorial Hall, which was built around the outcropping where True Father and one of his earliest disciples, Won Pil Kim, built a hut out of mud and cardboard in which True Father would complete the original manuscript for the Divine Principle. A few minutes walk from the memorial hall, we came to the Rock of Tears, where True Father as a young man and later True Parents together, have offered intense and tearful prayers of devotion to realize God’s will for humankind. Connecting to that same, deep spirit of prayer, many of the GTGY participants were similarly moved to tears as they placed their hands on the rock in prayer. Continuing up the mountain, christened “Mt. Cheonbu” by True Mother in 2001, we finally reached the summit, where you can look out over the whole of the Port of Busan and two, large pagodas stand, each representing True Father and True Mother. True Father was said to walk up to the summit, after a day’s work down in the port, to meditate and reflect on his mission and God’s heart. Today we got up bright and early for our pilgrimage throughout Korea. Since there are so many of us, we split into two groups and charted separate courses. Group 1 started with Cheongae or “Blue Sea” Garden in Yeosu. The site on which Blue Sea Garden is built was selected by True Parents to be the central location for the Ocean Providence in Korea in January 2003, after an extensive search for an appropriate site around the length of the Korean peninsula. During their stay there, the GTGY participants visited the local church and True Father’s Hoon Dok Hwe (scripture reading) room. Afterward, the group went to the Ocean Resort, where they enjoyed the sauna and swimming at the beach. Group 2 went to Paju Wonjeon, then to Cheonbok Gung, and then Cheongpa Dong. Our guide knew so much of the history, and shared about when True Parents spent their days here. Paju Wonjeon is a Unificationist burial ground located in the city of Paju, Gyeonggi Province. The approximately 500,000 pyeong (roughly 408 acres) of land at Paju Wonjeon was donated by Shin Shil Lee, a Presbyterian who joined the Unification movement in the 1960s. For staff member, Shinyoung Chang, it was her first time going to Paju Wonjeon. “I had no idea it was so large,” she said, “and that there are already 10 members of True Parents’ family resting there. Having hundreds of us there at once made the experience more profound than it could have been otherwise. There are many paths and levels, very beautifully landscaped. The entire experience really felt like a true pilgrimage of faithful people paying their respects. At the Cheonbok Gung, the Unification Peace Temple in Yongsan, Seoul, participants again had an opportunity to pray on their own. True Parents officiated the dedication ceremony for the Cheonbok Gung in February 2010. The Cheonbok Gung currently serves as the Family Federation for World Peace and Unification (FFWPU) Korea Headquarters, replacing the original church building in Cheongpa Dong, Seoul in that capacity. The “Cheongpa Dong Headquarters Church,” as the site was formerly known, saw many historic moments in the Unification movement, from some of the first educational workshops about the Divine Principle to the engagement and Holy Wedding ceremonies of True Parents, as well as the birth of several of their children. The day grew hotter, and the holy sites we visited instilled a sense of seriousness and reflection. As we continue this pilgrimage, we sincerely hope to gain a deeper understanding of True Parents’ life and the history of the Unification movement, in order to better connect with True Parents and be able to share about their life with others. On August 2nd, Sun Jin Moon, International President of Family Federation for World Peace and Unification (FFWPU) came with her husband In Sup Alexander Park, International Vice President of FFWPU, and sister-in-law Professor Yeon Ah Moon, International President of Women’s Federation for World Peace (WFWP), to spend time with the workshop participants. The Universal Peace Academy (UPA) band played a few songs to lift up our hearts and minds as we started our day together. Then the three guests walked up on stage, where they sat cross-legged on the stage floor wearing GTGY shirts! This set up made the participants particularly excited and open to hearing their remarks because it felt very familial and engaging. Sun Jin Moon guided the participants in a reading of True Father’s autobiography, A Peace Loving Global Citizen, then talked about her life and how the love of God and True Parents have helped her to address the obstacles she has faced. At the conclusion of her main remarks, there was an opportunity for question-and-answer, and a lot of the Japanese and international participants asked questions about True Mother and how to better understand her heart. They also asked how to serve True Parents well when they’re still so young. Sun Jin Moon answered the participants honestly and openly, sharing that True Parents, like our own parents, love us and want us to be happy and to excel in what we create. After the question-and-answer session ended, Sun Jin Moon then led a combined dance and exercise session featuring the famous “Bounce” song and also freestyle dancing. 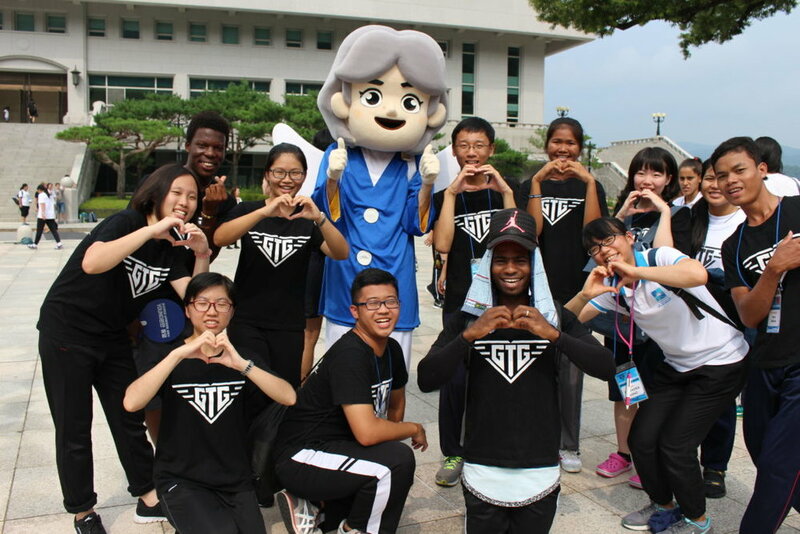 The international participants were particularly excited by the opportunity to dance together with Sun Jin Moon and the other GTGY participants. In the afternoon, all of the participants gathered together again to play icebreakers and get to know one another better. Because there are so many GTGYers here, it turned out to be a huge competition with games and prizes, and the winners were ultimately chosen by voting with rousing cheers. The participants then ended their day together as they will every day: practicing a song for one hour in the evening to be performed at the upcoming commemoration of True Father’s fourth Seonghwa anniversary. Many are even preparing to continue practicing the songs once we go on pilgrimage tomorrow, August 3. Be sure to stay tuned for more updates about our adventures as we head out on the road! 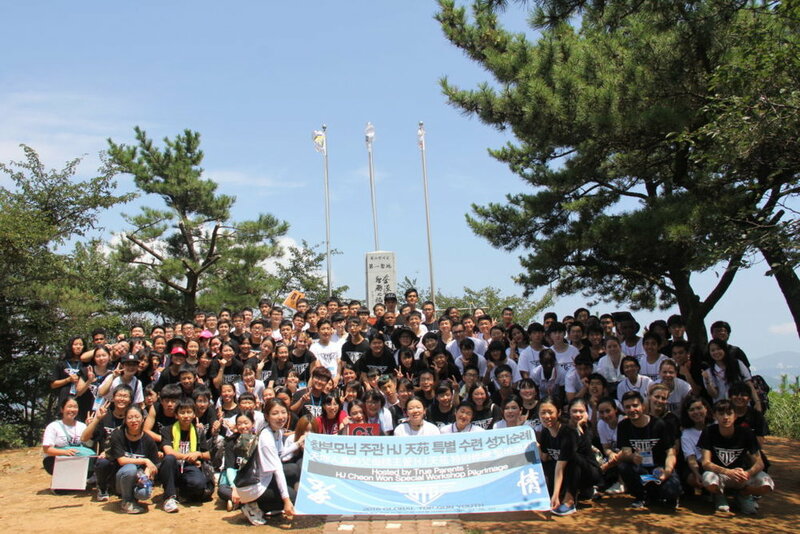 From August 1-21, one thousand youth will gather at Cheongpyeong for a special 21-day workshop hosted by True Parents. True Mother looks forward to speaking with everyone personally, and giving young people a unique chance to unite in heart with brothers and sisters from all over the world. Stay tuned to hear all about their experience. This blog will feature interviews, videos, testimonies and photos from GTG Youth. The past three weeks have felt like both a flash and an eternity in time. Now that the Global Top Gun workshop is over, it’s amazing that it went by so quickly; but at the same time each day was so full that it feels like we’ve changed so much. In review, many of those days were marked by lectures and testimonies. Some of those days were marked by exciting adventures, like the pilgrimage to Yeosu and Pusan or the DMZ Peace Road event. Every day was filled with incredible opportunities to build relationships that will serve as the foundation for collaboration, support and service in our future endeavors. Now that Global Top Gun is over, I’m also starting to see how, in a lot of ways, it’s just the beginning. Yes, we just spent three lovely weeks at a workshop in Korea with inspired men and women from 26 nations around the world—but if we fall into the trap of thinking that our journey as Global Top Gun begins and ends with that workshop, we’re missing the point. Global Top Gun, for those of us who have participated and will participate in it, is a calling. God and True Parents are calling us to inherit their vision for the world and to discover how we as individuals and a united community can contribute to that vision, starting now and continuing forever. We can’t know what the future holds, but I believe that if we step forward together in the confidence that God and True Parents imparted to us throughout Global Top Gun 2016, we’ll accomplish things that extend beyond even our biggest dreams. God is constantly working in our lives—and now we Global Top Gun alumni have the education and the impetus to act on that investment together, for the sake of the world. It’s the last day of our adventures here at Global Top Gun 2016, and the atmosphere here is one of inspiration, friendship and gratitude. We began our day with group meetings to plan our next steps after Top Gun. We split up into continental and then regional groups to identify who in the workshop will comprise our support team after going back home, and to determine what we hope to accomplish together when we get back. Each regional group was committed to sharing about our Global Top Gun experiences with our local communities, creating opportunities for more people to engage in Global Top Gun by hosting regional iterations of the workshop, and raising funds to support future participants’ travel fees to Korea. Following our morning meetings, Tasnah and Demian facilitated a unique appreciation activity. While one-third of us sat on the ground with our eyes closed, the other two-thirds of the group approached those sitting down in response to statements like, “I am happy that I got to know you” and “I love you more than you know.” We embraced one another, held hands, touched each other on the shoulder to express how these statements applied to our relationships, then switched out by thirds to have the experience of both giving and receiving these anonymous, heartfelt expressions of love and appreciation. It was a really moving, culminating experience for the workshop. Reflecting on this activity and the workshop as a whole, one participant, Boimah Massaley, shared, “I feel so much love and so much joy. I’ve always tried to love humankind, but there have been times when I have wondered why, when I’ve shown people so much love, I did not receive love in return. But right after this activity, I came to find that, yes indeed I can feel love—maybe I just needed to travel somewhere across the world to meet the people, from so many locations, who can show me love. President Lee of the Cheong Pyeong Training Center and Dr. Ki Hoon Kim, Continental Chairman of the Family Federation for World Peace and Unification (FFWPU) North America, followed with congratulatory remarks. With that, we received our certificates of completion and graduated from Global Top Gun 2016! And then started taking pictures left and right in our newly minted Top Gun aviators. Though we were sad to start saying our goodbyes right after the ceremony, we were also never more ready to take on the world—united together centered on God and True Parents. Stay tuned for our final reflections and takeaways, coming soon!